Ripon Museums will open for the 2019 season on Saturday 9th February and they’ve got a lot planned including plenty of family-friendly activities running during the school holidays! It’s spring cleaning time at the Workhouse! Bring your little helpers to the Workhouse for a taste of Victorian work! 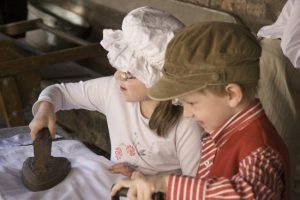 Workhouse children were well-scrubbed – have a go at making your own soap then try out our carbolic soap in the Laundry. Some workhouse boys were trained to be boot black boys so that they could earn a living when they left – make some boot polish to a Victorian recipe and you will always have shiny shoes. Then, as a treat (and Workhouse children did get the occasional treat), go through to our kitchen and bake some Laundry day biscuits to Victorian recipe. Follow our Soap Suds Trail around the Museum and out to the garden. To read more about upcoming activities at the museums see our blog.